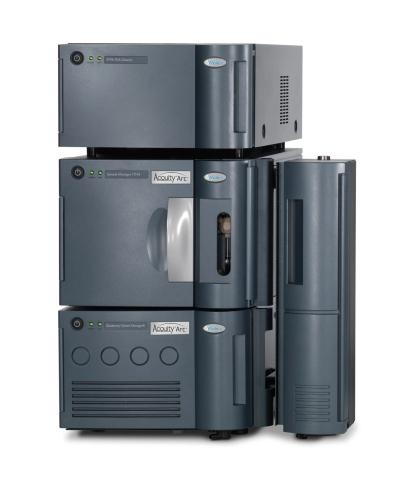 Waters has introduced the Acquity Arc system, a quaternary liquid chromatograph that gives analytical laboratories running established LC methods a clear choice for replicating or improving their separations performance. This new addition to the Acquity product line is engineered to respond to the needs of analytical scientists for a single LC platform that can enable them to efficiently transfer, adjust or improve their methods regardless of the LC platform on which they were developed. To date, scientists working with established methods haven’t had an LC platform versatile enough to bridge the gap between HPLC and UPLC. With the introduction of the new system and its enabling Arc Multi-flow path technology, scientists now have the ability to emulate the gradient dwell volume and mixing behaviour of various LC systems. By selecting the appropriate fluidic path, the Acquity Arc system can easily emulate a variety of HPLC systems without altering the method’s gradient table, or provide UHPLC performance with the flip of a switch.